Method: Take a wedge of lemon, squeeze and drop into shaker. 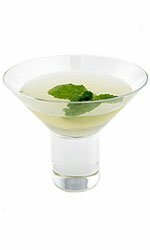 Add 1/2 shot runny honey, 1 shot pressed apple juice, 1 1/2 shots Stolichnaya Razberi, 1/2 shot BOLS Triple Sec and 6 fresh mint leaves. Shake ingredients together and strain into a chilled martini glass.